A lot of people have flags mounted at their homes or workplace and they want it to be visible at all times. Of course, the flags will always be visible during the day but what about when it is dark? This is where the solar flagpole light comes in. In this article, we will be writing about solar flagpole lights in general. 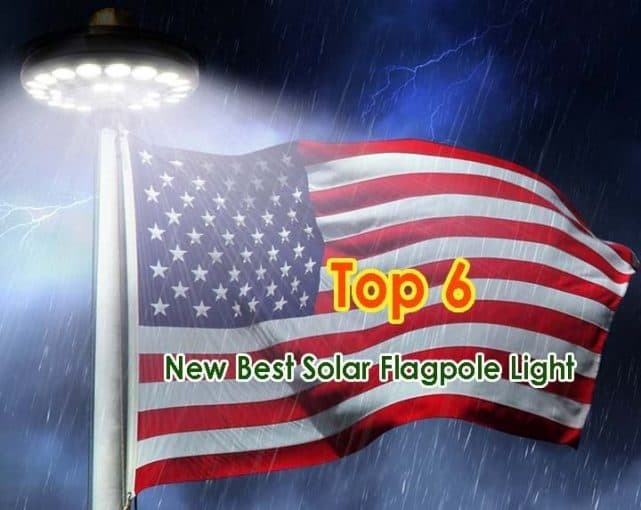 We will also be reviewing some of the best solar flagpole light available for sale. Just as the name of the device implies, flagpole lights are specially made for lighting up flagpoles. 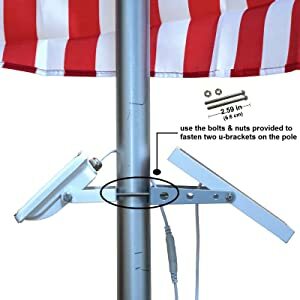 The flagpole lights can either be installed on the flagpole or placed around the pole. 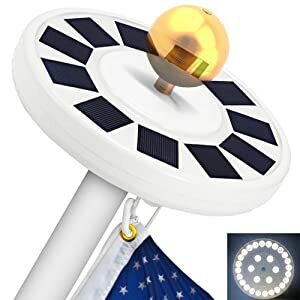 Solar flagpole lights are mainly powered by the sun which is a good source of energy for those that are peculiar about preserving the planet. Another good thing about the solar flagpole light is that it is cost effective. To ensure that you get the best solar flagpole light, make sure you follow some of the factors we will be highlighting below. Electrical appliances can suddenly develop faults for no reason and it is important that you have a sort of protection over such situations. When there is a warranty or a guarantee, you are assured of a refund, a repair or total change of the faulty product depending on the agreement the manufacturer has with the customer. This is why we will advise that you should try to get flagpole lights with a minimum of a year warranty to give you an assurance on the product you are purchasing. One of the mistakes people make when purchasing a product is by overlooking the reputation a company has carved for herself over time. 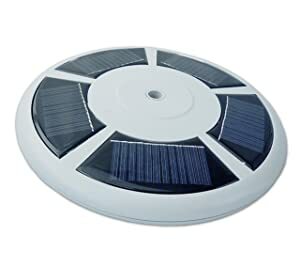 Regardless of how good the specification of the solar flagpole light is, you might find out that it is all a hoax if the company doesn't have a good track record. One of the things to consider is if the company is known for producing high-quality products, if the company has good customer service or if the company honours agreements. To know this, you can read up on reviews online or check a website like ours to see if we mentioned the company before. In addition, you should try to look at what consumer watchdog groups are saying about the products. By doing this, you will definitely have an idea of how reliable the company is because purchasing products from bad companies can be a disaster. Technology has advanced and things have become better than they used to be. Solar lights have also gone through improvements and this is why we will advise you to choose automated solar flagpole lights. Automated lights work by automatically turning on itself when it is getting dark and off when the sun is rising. This helps to ease off the stress of having to manually turn on and off the lights every time you need it. It is also a fantastic feature if you are not around as you will still have your flag lit up. Solar panels are different and solar cells are stronger than each other. Some solar panels are more efficient than each other and this means that some can collect any little sunrays and convert it to power immediately. The sizes of the solar panel can sometimes show how efficient they can be. But the best way to know a solar flagpole’s solar cell strength is by looking at the watt rating. This information is usually written on the manual of the product’s package if you want to confirm. You can also get this information on the manufacturer’s website. This is probably one of the most important factors you should consider when choosing the best solar flagpole light. You have to understand that the price of the product does not determine how well the product will work. Before purchasing any solar flagpole light, make sure that you carefully compare different products' prices with their functions. 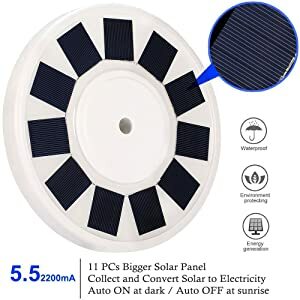 This is because it does not make sense of buying a pricy solar flagpole light with little function compared to a cheaper one with great functionality. Also, ensure that you do not dig too deep into your coffers in order to avoid regretting later. One thing you must always consider is the size of the flagpole because the sizes of the poles differ. It won’t be nice if you buy a solar flagpole light that does not fit the pole you want to mount it on. As you know, there are lots of solar flagpole lights that you can choose from. But we will like to help you to narrow down your choices to six. Below are the reviews of some of the best solar flagpole lights you can get. The TOTOBAY solar flagpole light is one flagpole light you do not want to overlook. This is due to the fact that the light is very bright due to its 30 LED bulb. In addition, the light has 11 big solar panels that allow it to collect sunlight easily and convert it to energy for use. 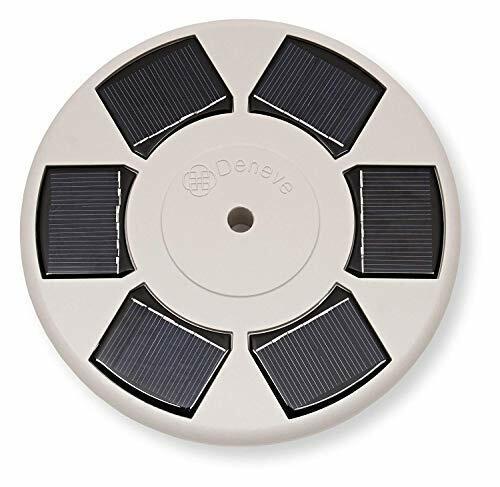 With its solar panels, you do not have to worry if the sun is shining well or not because it will get charged regardless. In addition, the solar panels have more photovoltaic cells than most of the flagpole lights available for sale. Furthermore, it has a 2200 mah rechargeable battery that ensures that the light remains on for up to 10 hours. One thing about this flagpole light is that it is not only suitable for home use alone as it can be used in parks, embassies and other public places. For ease of use, the light can turn on when the sun is setting and off when the sun is rising. You only have to make sure that you turn on the light before installing. 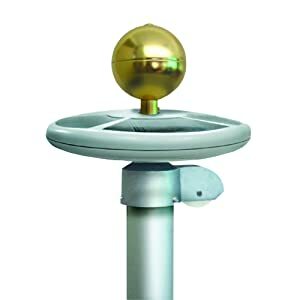 Also, Installation of the TOTOBAY solar flagpole light is very easy and we assure you that you won’t need the help of any professional to get it done. It is also compatible with most flagpoles but you still have to ensure that your flagpole has the right specification before purchasing. Finally, the light is very safe to use and this is particularly due to the absence of wires. The Deluxe solar flag pole light is one of the best solar flag pole lights we have come across. It has a beautiful, dazzling design that ensures that your flags are visible at all times. Furthermore, the solar panel of this flag light is very efficient as it captures the sun rays easily and this is made possible by its additional photovoltaic cells. It also has an automatic light sensor that lets it turn on itself when it is getting dark, and off when the sun is rising. This helps to reduce the stress of having to manually turn on and off the light every time. The light comes with very strong AA batteries that ensure that you have your flags lit up most of the time. 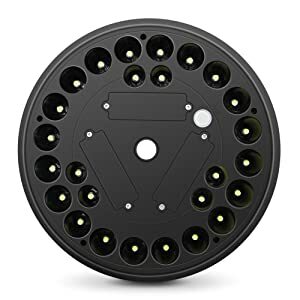 The good thing about these batteries is that they are replaceable which means that you do not have to dispose of the light when the battery goes bad. Installation of the light is also easy and you do not have to get any tools to get it done. You only have to ensure that your flag pole is compatible with the flag light. Also, like most flagpole lights, the light shines down in the direction of the flag herby making your flag very visible. Buying this flag light is also helps you contribute to a good cause because the company donates a part of the profit to charity. Finally, you are assured of getting a bright energy efficient LED bulb if you purchase this solar powered flagpole light. The Sunnytech solar flagpole light is the ideal light for small sized flags. The light is designed to illuminate the flag in such a way that it casts no shadow. This is made possible because the light shines directly on the flag. In addition, you are assured of very bright lights because of its 20 LED bulbs. These bulbs are powered by energy efficient solar cells that convert any little sunlight into energy. Also, the light’s electric circuits are well upgraded to ensure that they stand the test of time and serve the user better. Furthermore, the light has a waterproof feature that ensures it stays protected during rain falls or snow. This further makes the flagpole light a long lasting one. Also, with its sleek black colour, you will not only be getting bright lights but beautiful looking ones too. 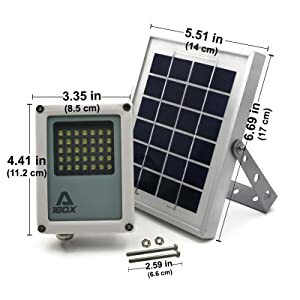 Additionally, the Sunnytech Solar Flagpole light has a light sensor that lets it turn on automatically when it is dark and off when it is dawn. Installation of the flagpole light is very easy and this is due to its ergonomic design. We assure you that it will take you a few minutes to set it up in as much as the flagpole is of the right size. Finally, the rechargeable batteries are very strong and you will definitely be getting long hours of light with it. Another feature of this light is its versatility as it can be used to light up signboards too. Installation of the light is very easy and it will only take a couple of minutes to have it set up. However, you have to note that the light is designed for flagpoles that are not lower than 15ft or higher than 25ft with a 0.5 inched thick rod. In addition, the light has an impeccable design that ensures that no wires are visible which also gives it aesthetic value. Finally, it has a light sensor that makes the light turn on when it is getting dark and off when it is dawn. The Annin Solar Flag pole light is a bright light with 20 LED bulbs and total lumen output of 100. The light's brightness ensures that the flag is well visible to those that care to look that way. In addition, the light has a very good solar panel that lets it collect sun energy easily for use at night. You can rest assured that even with the slightest sunrays, the light will get charged. 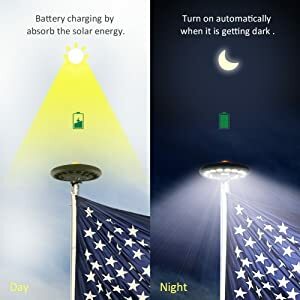 Also, the Annin solar flagpole light has powerful NiMH AA batteries that can last for up to 12 hours when fully charged. These batteries ensure that your flag remains lit all through the night. Furthermore, installation of the light is very easy and all you need to do is to read the manual included in the light’s packaging. One of the reasons why the installation of this light is easy is because of the lack of wiring which also makes it safer to use. Sometimes, good products tend to have their flaws and the major flaw of the Annin solar flagpole light is that it isn’t waterproof. This single flaw can lead to the lifespan of the light to be reduced. But, even with this flaw, the qualities of the Annin solar flagpole light still stands out. 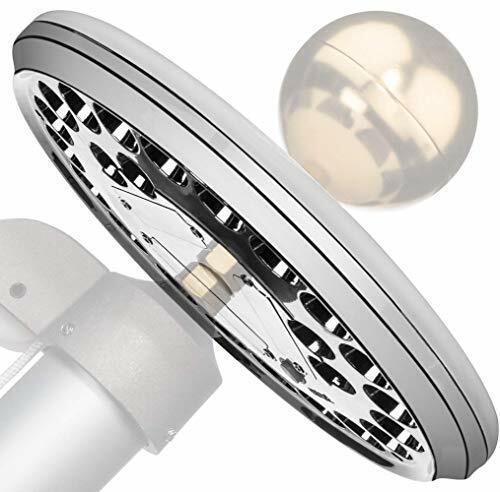 The Alpha 180X Flagpole light has a very unique design when compared to most of the flagpole lights on this list. This is due to the fact that the light does not shine downwardly towards the flag; instead, it fits around the pole shine upwards. 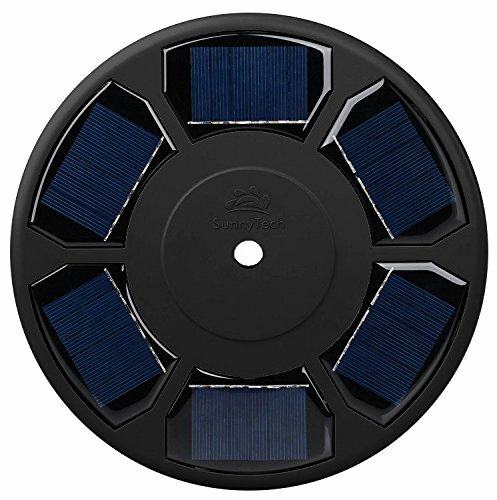 It is a unique design but it has a flaw which is; the shadow created by the light might interfere with the solar panel when collecting energy. Also, the shadow can as well reduce the light’s brightness. Also, the light comes with 3 different light settings which give you an option on how bright you want your light to be. The light has a total lumen output of 260 which we can all agree that it is very bright. The light is also powered by batteries that can last up to 10 hours if well charged. Furthermore, durability was put into consideration when manufacturing this flagpole light. This is evident by the frame being made out of strong cast iron which makes the pole resistant to corrosion. Another feature of this light is its versatility as it can be used to light up signboards too. Installation of the light is very easy and it will only take a couple of minutes to have it set up. Its improved mounting bracket is part of the reason that makes the installation seamless. In conclusion, when looking for versatility, efficiency and durability, then the Alpha 180X flagpole light should be considered. The light’s shadow can affect its charging. After completing this article, you must have learnt some few things about solar flagpole lights. Importantly, we made sure we wrote about factors you should consider before choosing a solar flagpole light. We deemed this important because we wanted to guide you in making the right purchase decision. 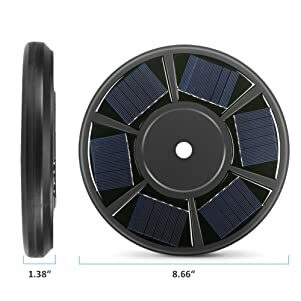 We are very sure that if you follow the guide, you will definitely go home with one of the best solar flagpole light out there. 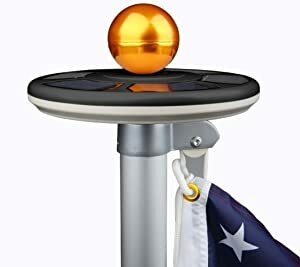 We also reviewed some of the few good solar flagpole light available and we concluded that the TOTOBAY solar flagpole light is the best on the list. This is due to its many features like; strong battery, bright lights, etc. Finally, we want to assure you that every flagpole light we reviewed in this article is of high quality and you won’t regret purchasing them. This light is very bright due to its 30 LED bulb. In addition, the light has 11 big solar panels that allow it to collect sunlight easily and convert it to energy for use. Furthermore, it has a 2200 mah rechargeable battery that ensures that the light remains on for up to 10 hours. One thing about this flagpole light is that it is not only suitable for home use alone as it can be used in parks, embassies and other public places.